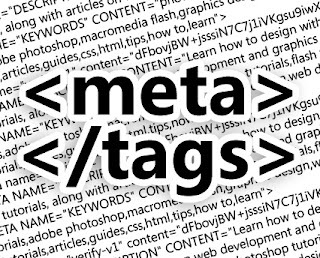 Meta Tags are really important part of Search Engine Optimization, So if you want your blog to rank higher in search engines, It is important for you to optimize your blog with relevant tags because Search engines matches the user quires by these tags, So if you lack them you won't get good rankings. Blogger is one of the most popular blogging platform on the web, But blogger has some SEO issues and if you want to be a successful blogger, you'll need to fix them by your own. Meta tags is one of the main blogger problem, unlike Wordpress platform which is very strong in these regions. This does not means that you can't be successful on blogger, well you can if you follow some SEO practices. You can Read more about SEO here. Meta tags are actually HTML tags in your template which tells search engines, what is the webpage about. Meta tags have 3 important parts, 1)Meta Title 2)Meta Description 3)Meta Keywords. 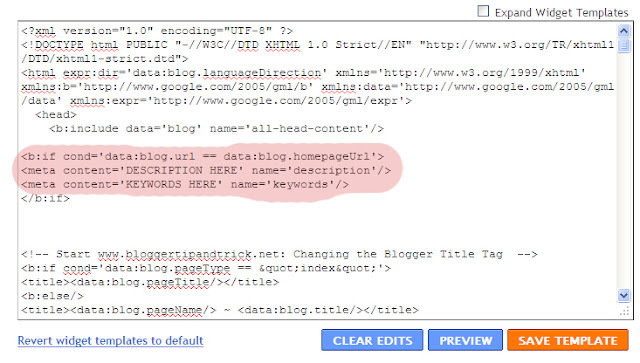 How to Add Meta Tags to Blogger. Adding Meta tags to bloggers isn't a big deal, any one can do it easily. Follow the below steps. Now carefully, Add this script below the code you just found in above step. Enter a Short description about your blog on place indicated with "DESCRIPTION HERE"
Enter a main keywords of your blog on place indicated with "KEYWORDS HERE"
Keep the description short about 150 words and to the point and don't just stuff it with keywords. On keywords place, Enter keywords which are most relevent to you content. Don't repeat keywords again and again, Search engines call it spamming and it can ruin your rankings. Hope you liked this tutorial, Keep coming back for lot more. Please share it if you like my work (use the widget on left). You can also leave your comments below and I'll Try to reply as soon as possible.